2. 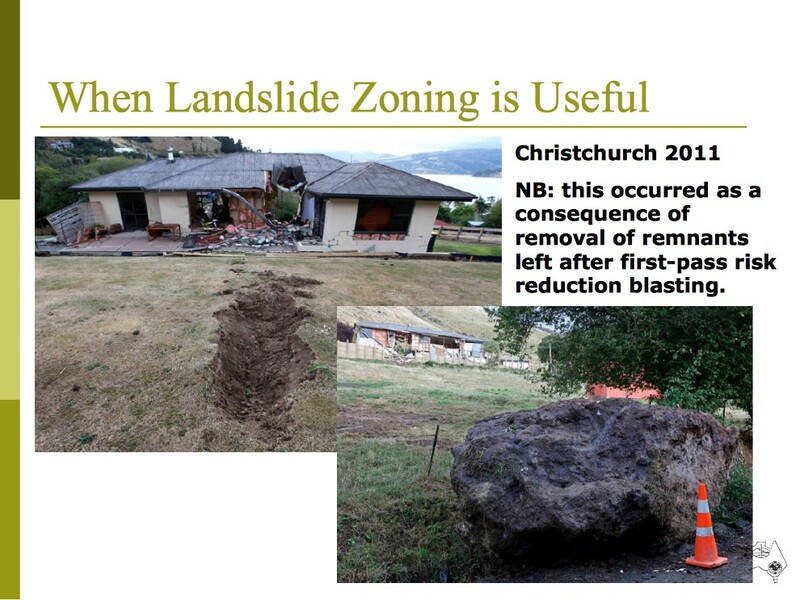 Where is landslide zoning useful for land use planning? Only useful where there has been previous landsliding. Only useful where the topography suggests landslides might occur. 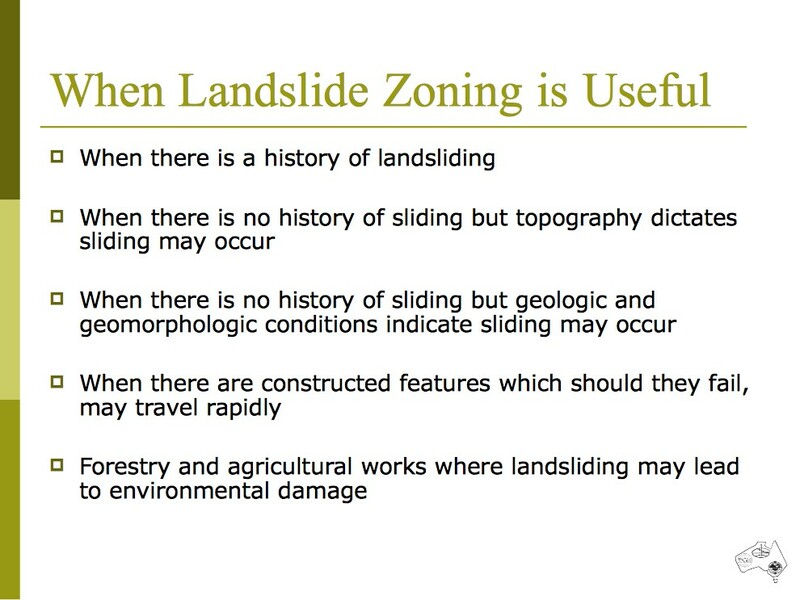 There are many situations when landslide zoning is potentially an issue in land use planning. Landslide zoning for land use planning is most commonly required at the local government level for planning urban development, but may be required by state or federal governments for regional land use planning or disaster management planning. It may also be required by land developers, those managing recreational areas or those developing major infrastructure such as highways and railways. The following are some examples of situations that are more susceptible to landslide occurrence. Their identification through landslide zoning would facilitate development planning and landslide risk management. It is the combination of having an area, which is potentially subject to landsliding and the scale and type of development of the area that will determine whether landslide zoning is needed for land use planning. Deep-seated sliding on natural slopes. Widespread shallow slides on steep natural slopes. Rock falls from steep slopes and cliffs. Rock falls from coastal cliffs. Landslides in cuts, fills and retaining walls on roads, railways and associated with urban development. Large currently inactive landslides subject to undercutting by active erosion of the toe or subject to reactivation by development. Debris flows and earth slides from previously failed slopes. Widespread shallow creep type landslides in slopes of any inclination. Natural slopes steeper than 35o (landslide travel is likely to be rapid). Natural slopes between 20o and 35o (rapid landslide travel is possible). Steep, high road or rail cuttings. Steep slopes degraded by recent forest logging, forest fires and/or construction of roads. Large currently inactive landslides subject to rising groundwater regimes; e.g. by forestry and agricultural operations. Weathered basalt overlying other more competent rocks (sliding often occurs on the boundaries). Weathered granitic and volcanic rocks. Weathered interbedded rocks (such as claystone, shale and siltstone) and sandstone or limestone. Riverbanks in soil subject to floods and/or active erosion. Steep natural slopes in regions affected by large earthquakes. Slopes in highly sensitive weak clays (e.g. quick clays). Where there is active undercutting of slopes by rivers or the sea. In seismically active regions slopes in loose saturated soil which are susceptible to liquefaction. Loose silty sandy fills (residual/extremely weathered granite; ripped sandstone etc). Other side cast fills on steep slopes. Mine overburden spoil and mine waste dumps, particularly those sited on hillsides. Tailings dams constructed using upstream construction methods. Forestry works and agricultural land clearing where landsliding may lead to damage to the environment by degrading streams and other receiving water bodies. It should be noted that rapid sliding is important because of the potential for life loss. However slow and very slow moving landslides are also of importance because they may also lead to property damage.